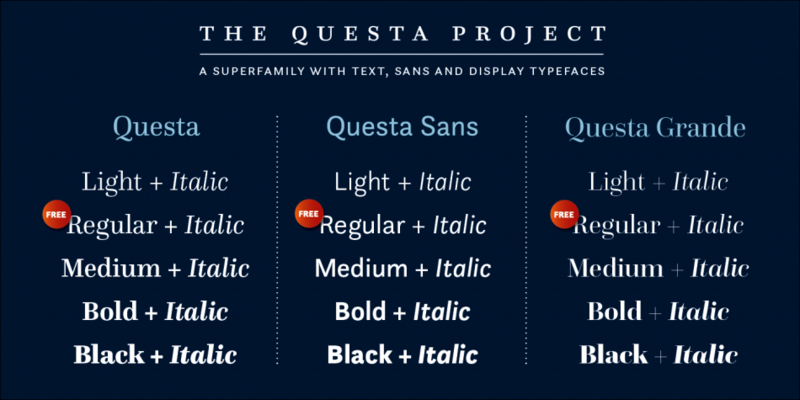 Questa is a collaborative type design project by Jos Buivenga and Martin Majoor. In 1985 I started my career as a type designer, resulting in the five font families FF Scala, Telefont, FF Seria, FF Nexus, and Questa (in collaboration with Jos Buivenga). This is an average of one font per 6 years. Admittedly, this is not very impressive, but I can explain. First of all my fonts are fairly large families, combining serif, sans and sometimes slab serif into one connected super family – as explained in ‘My type design philosophy’. Secondly I did a few other things in the last 25 years: book design, book collecting (I love books on typography), smaller type design projects, teaching, raising my two children, travelling between Holland and Poland, giving lectures and interviews, writing articles for magazines and for books. I don’t have plans to speed up my work, but it is not inconceivable that I’ll end up with an average of 1 font per 5 years. So I have to make another 3 type families before I turn 70. This website is my public and ever expanding archive. My latest activities and news can be found on Majoor’s Type Blog. Enjoy it! The hands of this handshake can be found in Scala Hands as part of the Scala family. The left seriffed hand has been designed by Bruce Rogers in 1933 to be used in the book ‘Æsop’s Fables’, the right hand is my own sans serif version of this printer’s ﬁst. The handshake symbolizes the cooperation between serif and sans, rather than its rivalry.